Networking Games and the topics in this lesson have been very rare on the LSAT for the last decade. If you are short time or are struggling with the more popular game types, you should skip this chapter and move straight to the Logic Games Review section. Like computers linked in a network, the elements of network games are connected. Your task in solving these games is to determine the nature of these connections. Elements will usually be presented in the initial premise or set-up of the game – the conditions will then describe the connections between the elements. It’s then up to you to figure out the network! Usually, all the answers can be quickly determined by simply reading what you have drawn. Start with a roster of the elements. By writing out the roster for each game, you won’t accidentally forget one or more of the elements when trying to answer the questions. Once the roster has been created, create a diagram in which the elements are arranged circularly. Next, read through the conditions and represent them symbolically on this diagram. A simple strategy is just to use the letters you have assigned in the roster. Let’s look at a sample game with a simple premise and only two sentences describing the conditions. Five cities- A, B, C, D, and E – are connected by a series of roads. At most, one road connects any two cities. All cities are connected to at least one other city. All of the roads connecting these five cities are either one-way or two-way roads as follows (assume that the roads described are the only roads connecting these cities): The roads between A and C, A and D, and B and D are all two-way roads. The roads from A to B, C to E, and E to A are all one-way roads. First of all, we will need to represent the cities. In this case, the roster consists of A, B, C, D, and E, and we will use these letters. 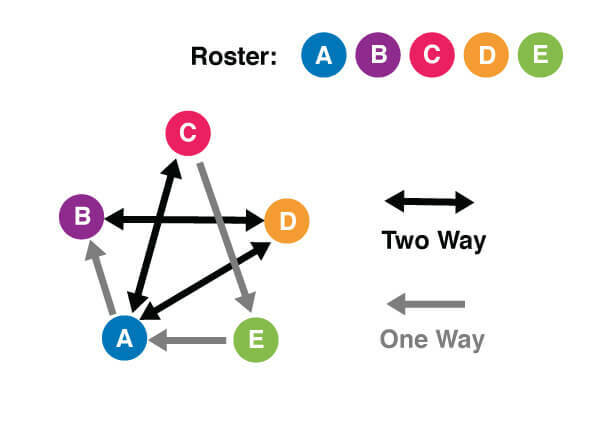 How do we know how to arrange the cities? We don’t know anything about the positioning of the cities with relation to each other, but we don’t need to. For this problem, we are only interested in the connections between the cities, not their actual locations. The best way to arrange the elements in a network game is in a circular form with the elements spaced evenly. Once you have summarized all of the information from the conditions, review the initial premise to make sure that your diagram does not violate any of the conditions outlined there. Be sure that any additional information provided within the premise has been included in your diagram. We can double-check that in our diagram, each city is connected to at least one other city and that there is at most one road between any two cities. This diagram meets all of the criterion. Now, let’s try to answer some questions for this sample game. (1) Which city has the greatest number of direct road connections to the other cities? From city A, roads lead to B, C, D, and a road enters from E. Since we have only five cities, and city A has four connections, this is likely to be the right answer. But let’s first go through the other answer choices first so we can be sure. City B can be reached from A, but from B, one must travel to D. These are fewer connections than A, so we can eliminate this possibility. City C is connected to A and D by a two-way road and a one-way road that leads to E, for three direct connections. This is still fewer than the four connections of A. City D also has three connections, and city E has only two, and both one-way. Therefore, A is the correct answer. (2) What is a complete list of the cities from which a traveler could not drive directly to city B? From city C, city B cannot be reached directly. This is one of the cities, but we do not yet know whether this is a complete list, so let’s first go through the other answer choices. From D, there is a two-way road to city B, so choice B is not correct. Likewise, we can eliminate choices C and E since they too contain city D as one of the cities. If we check choice D, which is cities C and E, we see that in fact both C and E are cities from which a person could not travel directly to city B. Therefore, choice D is the correct answer. Let’s try another game, one that is a little more complicated, to get more practice in creating network diagrams. In celebration of a very profitable year, the board of directors of an international corporation decides to hold a special meeting in Basel, Switzerland to honor the company’s top six executives, Mr. Andrews, Mr. Das, Ms. Farmer, Mr. Gaal, Ms. Petrucci, and Ms. Win. Mr. Andrews speaks English and German. Mr. Das speaks Hindi and French. Ms. Farmer speaks German and Russian. Mr. Gaal speaks Russian and English. Ms. Petrucci speaks French and English. Ms. Win speaks Russian and Hindi. Okay, once we have read through the game, we can see that the elements are the six executives. What are the connections between the elements? These will be languages, or the ability to communicate with each other. As before, our first step is to create the roster. Since we are given names, let’s simply use the first letter for each name. Now, let’s arrange these six elements into a circular pattern. Between the elements, in the center of the circle, is where the connections will be placed. Now, how will we represent the connections? In this case, we can simply use lines to connect people with a shared language. (We don’t need to use arrows, because by definition, sharing a language means that each person can speak it to the other.) Let’s now translate the information given by the conditions into drawn connections between our six elements. A good strategy is just to start with one person, and go through each of his languages, and see what other person (or persons) also speaks those languages. Let’s start with Mr. Andrews (A). He speaks both English and German. Who else speaks English? Mr. Gaal and Ms. Win (G and W) both speak English. 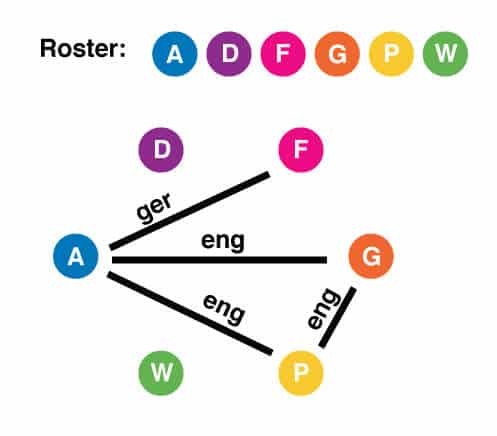 So we can draw connections from A to both G and W. What other connection can we draw? Well, at this point, we could also draw in the connection between G and W, since we’ve just noted that the two of them speak English. At this point, just placing as many of the conditions onto the diagram as possible should be your main strategy. After you have gone through all the conditions and translated them to your diagram, you can then go back over the conditions to make sure you have not either missed or duplicated any of them. Back to Mr. Andrews, we know that he also speaks German. Who else speaks German? Ms. Farmer (F), so let’s draw a line connecting A and F.
Now, if you look at the diagram, can you tell who is speaking what language? Do F and P speak the same language since they both are connected to A? No, they don’t, and it’s important to remember that just because two elements each connect to another element, it does not mean that those two elements necessarily have any connection at all between them. This would be an invalid assumption. One way to avoid this confusion would be to label the connections in some way that describes them, such as shown in the following diagram. Do we need to know who speaks which language? At this point, we don’t know. In the interest of simplicity, let’s assume we don’t need to know the languages at this point. 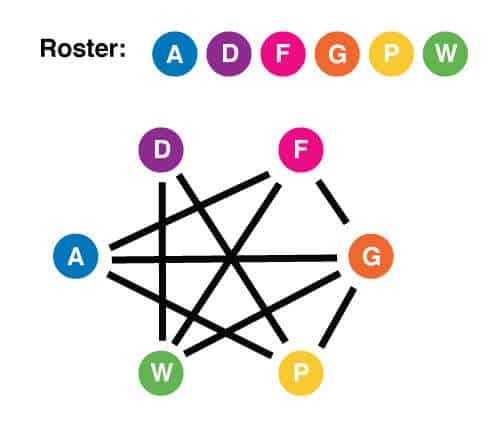 Let’s place the other connections onto our diagram, working through each element in the order in which they appear in the conditions. Once you have translated each condition, read through the conditions one more time to be sure that you have not missed any connections between elements and that all of the connections you have drawn are accurate. You may have noticed, as you work your way through the conditions, you find that some you have already placed on the diagram as a result of them being two-way connections. When this happens, it just serves as another way for you to double-check the relationship between the elements. Now that we have the network diagram, let’s try some questions. (1) If Mr. Das and Mr. Gaal wish to converse, which of the following represents a complete list of the people who could serve as an interpreter? Mr. Das and Mr. Gaal do not share a language, that is, we have drawn no line connecting them. An interpreter would be someone who can speak the same language as Mr. Das and also speak the same language as Mr. Gaal. We are looking for an element that is connected to D and connected to G. Choice A is Mr. Andrews. A is connected to G, though not to D, so this cannot be the correct answer. Choice B is Ms. Petrucci. In our diagram, P is connected to both D and G, so this is a correct answer. We are asked for the complete list, however, so we must continue to work through the answer choices. Choice C is Ms. Win. We can eliminate this choice immediately on the basis of it not including Ms. Petrucci. Choice D is Ms. Petrucci and Ms. Win. If we consult our diagram, indeed Ms. Win is connected to both D and G. Choice E adds Mr. Andrews to the list, but we have already eliminated him as a possible interpreter. Choice D is the correct answer. Let’s try the second question. (2) Besides Ms. Win, who can converse with Ms. Farmer without an interpreter? We are asked who can converse with Ms. Farmer without an interpreter. In the context of our network diagram, this question is asking to which other elements, other than W, is element F directly connected. By looking at our diagram, we see that F is connected to A, W, and G. Therefore the correct answer is choice C, Mr. Gaal and Mr. Andrews (G and A on our diagram). (3) Which of the following pairs of people cannot converse without an interpreter? Starting with choice A, we see that A and P are connected on our diagram, so this cannot be the correct answer. Choice B, D, and W are also connected, so we can eliminate this choice. Choice C, G, and P are connected, so this is the incorrect answer. Choice D seems to be the exception, as D and F are not connected on our diagram. To be sure, let’s check choice E. We see that A and F are connected, so choice D represents the only pair of people (of the choices given) that cannot converse without an interpreter. Let’s do one final question for this game, which is structurally different. (4) Of the five languages spoken by the six executives, which are the two most common? As you remember, we have not included anything about which languages are spoken by which people on our diagram. Can we solve this question from our diagram? Unfortunately, no. We basically need to determine how many people speak each of the languages. 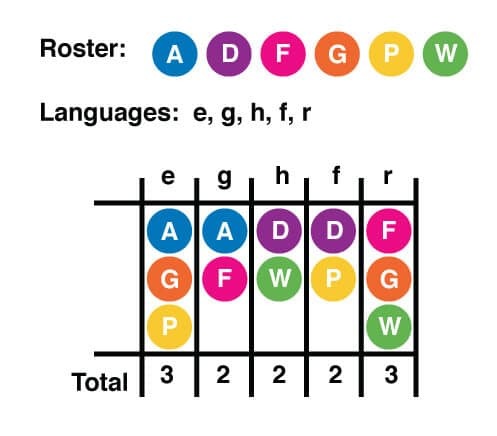 The best way to do this is make a small table in which each column represents a language, and underneath, we can list the people that speak each of those languages. Then we can simply count how many people are in each column. The table would look something like this. From this, it is easy to see that English and Russian are the most commonly spoken languages. Therefore, choice E is correct. In a group of five friends- P, Q, R, S, and T- rumors are passed according to the following conditions. P passes rumors to R, S, and T, but nobody from the group passes rumors to P. Rumors can pass from R to S, but not from S to R. Rumors can pass in either direction between S and T. Rumors can pass in either direction between Q and R. Rumors can pass from Q to S, but not from S to Q.
Let’s try one final game to illustrate the best way to solve network games. Unlike the previous games, we also show you the first question (like on the exam). (1) Which of the following is a complete list of the people to whom a rumor can be passed directly from Q? Okay, let’s start by creating our network diagram. What are the elements? In this case, the elements are the five people, P, Q, R, S and T. What are the connections? The connections between the people are the way in which rumors can be passed. Your network diagram might look something like this. Like the other diagrams, we have arranged the elements circularly to illustrate the connections between them in the middle of the circle. We have used arrows, some pointing in two directions, others in only one direction, to indicate the direction of the flow of information. Let’s tackle the question. We are asked for the complete list of the people to whom a rumor can be passed directly from Q. 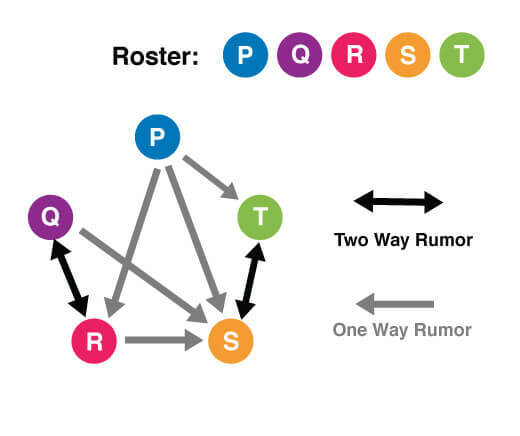 By consulting our diagram, we see that a rumor from Q can go directly only to R and to S, choice C.
(2) To which person in the group can any other person pass a rumor directly? Consulting our diagram, we need to look for the element that is connected to all other elements (with the arrows pointing at that same element). We can see that the only element that satisfies this condition is S.
Again, let’s consult our diagram. If we start with R, the rumor cannot be passed directly to T, but instead must be passed to either S or Q. If it is passed to S, then it can be passed directly from there to T. If R first passed to Q, then it must be passed to S and then to T. In both scenarios, S is required. Since we are asked which friend must have been told, choice C is the correct answer. Now, if we were asked which group members the rumor might have been passed to, the answer would be S and Q.
Hopefully, these three sample games have helped to illustrate the different kinds of network games that you might see on the exam. The critical skill needed to successfully work through these games is to be able to draw an effective and accurate network diagram. Look over the examples of network diagrams presented here, and use these as guidelines in creating your own. As with other games, start with a roster of the elements. 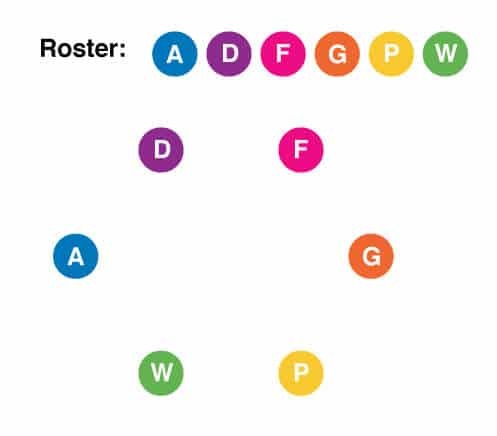 Once the roster has been created, create a diagram in which the elements are arranged circularly. Next, read through the conditions and represent them symbolically on this network diagram. Read through the premise and conditions again to be sure you have translated all the information onto your diagram. Read the question and solve by consulting the network diagram.